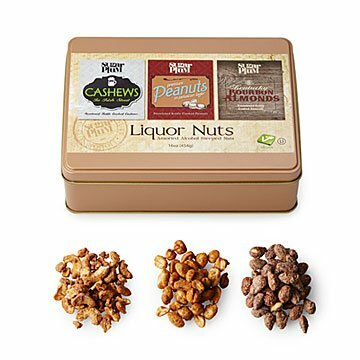 Beer, booze, and nuts combine in this tasty gift set. Beer, booze, and nuts—the bar snack besties meet again in this trio of tantalizing tins. Kettle-cooked cashews, peanuts, and almonds are infused with Irish stout, Jamaican lager, and bourbon respectively, giving each one a potent punch. Salty, sweet, and spirituous, this gift set will delight the bar fly, sports nut, or choosy snacker in equal measure. Made in Pennsylvania. Tin: 7.5" L x 5.5" W x 2.5" H; 16 oz. Ingenious gift idea. Tasty too! I gifted this to my father, who loves to have a salty snack alongside his beer. He loved it! Delicious and fun! The packaging was great and the nuts each have such a distinct flavor. It's a perfect gift for foodies. Christmas gift for my husband. He loved the taste, especially the bourbon ones. Fun and unusual gifts. Love it!! would not buy again, unfortunately. No salt made this product taste flat. The name makes it sound much tastier than it is. I was disappointed, did not taste the beer or the bourbon. The presentation box is nice and therefore it worked as a companion gift. I would not buy this again but the nuts were fine eat...you will get the same or better at the supermarket. This was a Father's Day gift for my Father-In-Law who loves unique foods. He loved them. Husband enjoyed, took them hiking.